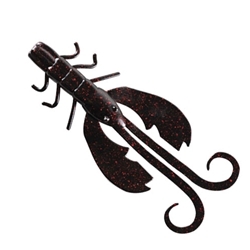 Berkley's Crazy Legs Chigger Craw creates additional action on the fall or retrieve to entice wary or curious fish. This Bassmaster Classic winning bait creates more strikes with its high action pinchers, while the crazy legs can swim with fast or slove movement and even flutter during a pause in the retrieve. This craw if perfect for dead sticking!